The Viera Hawks celebrated Senior Night on Tuesday with a 5-3 comeback win over Titusville. *Photo by Desiree Angelle Photography courtesy of @hawksrbiclub. Over their playing careers the seven seniors on the Viera Hawks roster have seen plenty of exciting wins at their home field at Space Coast Stadium. 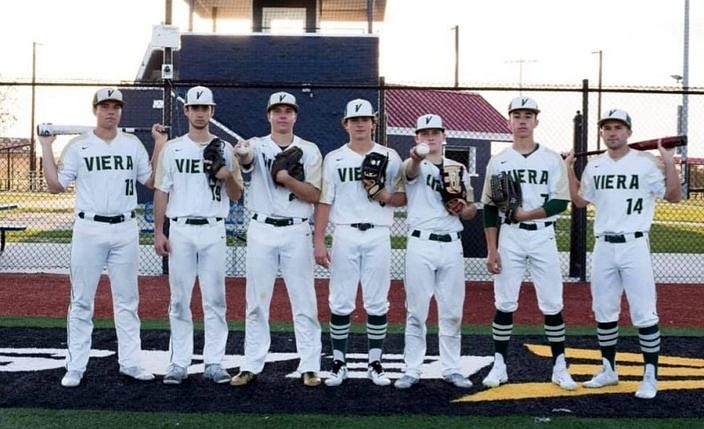 As the program celebrated their many contributions, they enjoyed another thrilling memory as Viera rallied to a 5-3 victory over Titusville on Tuesday night. The Hawks trailed by three runs before storming back, with four runs in the bottom of the fifth inning leading them to victory. Viera (14-4) got the rally going by loading up the bases in the fifth. Luke Brown reached on an infield single and both Joseph Veltri and Andrew Brait followed with bunt singles that filled the bags. An infield grounder off the bat of Connor Leary plated Brown, as Brait was erased at second on the fielder’s choice. Alan Espinal then smacked an RBI double to left that tied the game, and senior Brady Janssen delivered the winning hit when he lined a base hit to center that drove in Leary and Espinal. Brady Janssen also scored Viera’s first run, when Zach Taylor grounded into a fielder’s choice in the fourth. The Terriers (10-3) scored all three of their runs in the third. Titusville loaded up the bases on base hits from Ian Hanson, Roc Irlbeck and Trey Felker, and Jackson Woodward came through with the first big hit of the night on with a single to right that plated two base runners. A passed ball then allowed Felker to score to give his club a 3-0 advantage. Andrew Brait led all hitters by going 3-for-4, while Alan Espinal was 2-for-4 with a double, an RBI and a run.